Those of you who follow my blog on a regular basis will have noticed that there has been no posting for 6 days! Fear not – I have been sewing just that the project on which I am working is very much a WIP (work in progress). I have finally bitten the bullet and started the quilting of my Drunken Caribbean Birds quilt. I last discussed this project on 26th May and since then I have made a couple of garments but now I have taken over the dining room, extended the dining table to its full size and got down to some ruler and free-motion quilting. This is my first venture into ruler work and I have to say that I am loving it! 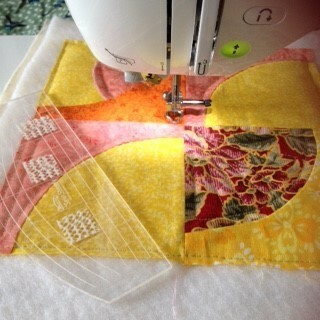 I spread the quilt all over the table, roll up one side to slide under the arm of the sewing machine and get stitching. OK it is not perfect but I am getting there and really enjoying the process. This is a real lesson in slow sewing. 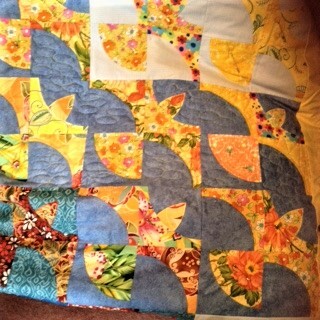 So far I have quilted about a dozen of the bird blocks and filled in the ’empty’ spaces with ovals. I am using a Westalee ruler plus a ‘french curve’ template which has different-sized oval cut outs that are ideal for the filler motifs. I am trying to work on the quilt for about an hour at a time before taking a break. That way I hope to avoid too much strain on my shoulders, try as I might, I cannot stop myself from tensing up as I wrestle the quilt and rulers whilst stitching. Taking a break also gives me the opportunity to refresh – and cut out other projects! So the next post will probably be a garment. Stitching, cutting, stitching, cutting ……..